I know all to well what it feels like to become overwhelmed and want to give up, which is why the smallest gestures can have the greatest impact and turn everything around. I want to honor someone in a school who deserves a LIFTT (Little Inspirations for Trying Times) so they can be encouraged and reminded of their value in this world. Do you know someone? 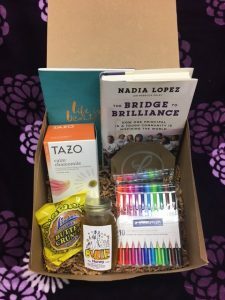 If the answer is YES, nominate them for the chance to win a box of LIFTT containing a few of my favorite things. Click here to nominate an unsung hero who works in a school (it can be yourself or someone you know). In 300 words, share the story of how the nominee has made a difference in the lives of a children and why they deserve a LIFTT. All entries must be submitted by Monday, December 19 at 11:59pm (EST). Submission does not guarantee selection. The winner will be announced via social media, Thursday, December 22, by 3pm @theLopezEffect on Facebook, Twitter and Instagram. The LIFTT Gift will be mailed out the week of December 26, 2016. It is important that we engage in acts of kindness to recognize the value in others and be the good in this world. SHARE the post and TAG your friends!